The basal notoungulate families Henricosborniidae and Notostylopidae are mainly known from Eocene fossil sites. Henricosborniids have also been identified from at least one Paleocene site (Tiupampa), and notostylopids survived into the early Oligocene based on a recently named species from Chile, Chilestylops davidsoni (Bradham et al. 2015). The cheek teeth of notostylopids are rather distinctive (see Simpson 1948 for details), but this is not the case for henricosborniids, whose teeth resemble those of some basal typotheres. As a result, some henricosborniid genera have been placed in different families by different authorities. The taxonomy here follows López (2008). Henricosborniids were small to medium-sized animals and are relatively poorly known. As far as I am aware, only two henricosborniid skulls have ever been described, both from the Mealla Formation of northwest Argentina (Pascual et al. 1978). Each of these skulls formed the basis for a new species: Simpsonotus precursor and Simpsonotus major. The former is about 11 cm (4.4″) long and the latter is about 6.7 cm (2.6″) long. This suggests these animals had a head-body length of about 30-50 cm (12-20″) and were about the size of a large squirrel or a small cat. Unfortunately, no limb bones of these animals have yet been identified, so we have no good idea of their postcranial adaptations. They had low-crowned (brachydont) teeth and a complete, closed dentition. However, the third pair of upper incisors were enlarged and caniniform (canine-like). Reconstruction of Notostylops (from Dixon et al. 1988). Notostylopids are better known than henricosborniids and are represented by both skulls and postcranial specimens, though limb bones of notostylopids have not yet been formally described. Notostylops itself is especially common in late middle Eocene (Barrancan) strata in Argentina, so much so that these layers were referred to as the “Notostylops beds” by early paleontologists. They were generally medium-size mammals. Macrini et al. (2010), who described the inner ear structure of Notostylops using computed tomography (CT), estimated the body mass of a small specimen at about 3 kg (6.6 lbs. ), similar to a raccoon. Notostylopids had rather low, boxy skulls, and their teeth are distinctive. In their upper jaw, the first pair of incisors are enlarged, the second and third pairs of incisors and the canines are very reduced, and there is a large space (diastema) between the canines and the chewing teeth in back (premolars and molars). In the lower jaw, it is the second pair of lower incisors that are enlarged. The first pair are small and located directly in front of the second pair (rather than between them). The third incisors, canines, and first premolars are all small and sometimes absent. 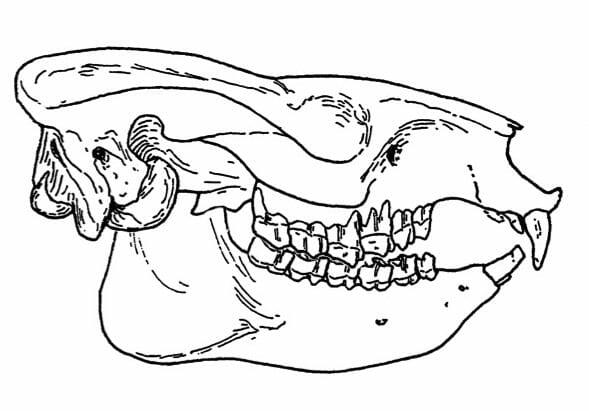 The overall form of the anterior teeth is reminiscent of that of hyraxes. Simpson (1980) described these teeth as being designed for “nipping” instead of gnawing. Curiously, a recent phylogenetic analysis of native South American ungulates suggested that Notostylops was more closely related to pyrotheres than other to other notoungulates, based in large part on similarities in the anterior dentition (Billet 2010). The idea that pyrotheres have a common ancestry with notostylopid notoungulates is an intriguing hypothesis. More complete remains of early pyrotheres are needed to further test this idea. Notostylopids had low-crowned cheek teeth (premolars and molars) and, like most Eocene ungulates, are assumed to have been browsers that fed on leafy vegetation. Billet, G. 2010. New observations on the skull of Pyrotherium (Pyrotheria, Mammalia) and new phylogenetic hypotheses on South American ungulates. Journal of Mammalian Evolution 17:21-59. Bradham, J., J.J. Flynn, D.A. Croft and A.R. Wyss. 2015. New notoungulates (Notostylopidae and basal toxodontians) from the early Oligocene Tinguiririca Fauna of the Andean Main Range, central Chile. American Museum Novitates 3841:1-24. Dixon, D., B. Cox, R. J. G. Savage, and B. Gardiner. 1988. The MacMillan Illustrated Encyclopedia of Dinosaurs and Prehistoric Animals. MacMillan Publishing Company, New York, 312 pp. López, G. M. 2008. Los ungulados de la Formación Divisadero Largo (Eoceno inferior?) de la provincia de Mendoza, Argentina: sistemática y consideraciones bioestratigráficas. Tesis doctoral, Facultad de Ciencias Naturales y Museo, Universidad Nacional de La Plata, 415 pp. Macrini, T.E., J.J. Flynn, D.A. Croft, and A.R. Wyss. 2010. Inner ear of a notoungulate placental mammal: anatomical description and examination of potentially phylogenetically informative characters. Journal of Anatomy 216:600-610. Pascual, R., M.G. Vucetich, and J. Fernández. 1978. Los primeros mamíferos (Notoungulata, Henricosborniidae) de la Formación Mealla (Group Salta, Subgrupo Santa Barbara). Sus implicancias filogenéticas, taxonómicas y cronológicas. Ameghiniana 15:366-390. Paula Couto, C. d. 1954. On a notostylopid from the Paleocene of Itaboraí, Brazil. American Museum Novitates 1693:1-5. Simpson, G. G. 1980. Splendid Isolation: the Curious History of South American Mammals. Yale University Press, New Haven, Connecticut, 266 pp. Vucetich, M.G. 1980. Un nuevo Notostylopidae (Mammalia: Notoungulata) proveniente de la Formación Lumbrera (Grupo Salta) del noroeste Argentino. Ameghiniana 17:363-372.